We landed in #Yerevan, and went straight a joint event with Girls in Tech, Inc. Armenia, where IE professor as well as an IE alumni Christina Stathopoulos talked about how to land a #dreamjob in tech , and what it is like to be a woman in #techbusiness. In addition, we were honored to have incredible women joining us for a panel discussion Yeva Hyusyan – Co-Founder and CEO of SoloLearn, Irina Volk – General Director of Dell UMC UCiS, IE Alumni and Asya Dallakyan – Territory channel Manager at Microsoft. Thank you ladies for sharing your experiences with us. 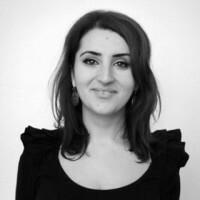 Sati Boyajyan has an extensive international experience, having lived and worked in 6 countries. Her roles primarily concentrate on the intersection of marketing and business strategies. In 2016, Sati founded a boutique consultancy that specializes in developing marketing, branding and communication strategies for small and medium enterprises in Caucasus region. Prior to that, Sati led the Product Development department for Luardi accessories brand in Hong Kong and USA, and consulted on marketing strategy projects in Armenia. Sati is holds a Master’s degree from IE Business School (Madrid, Spain) and Bachelor degree from University of Bristol (Bristol, UK). Currently, Sati is the Associate Director for Eastern Europe and Central Asia at IE University and IE Business School.